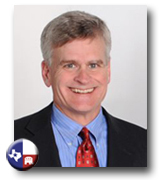 Republican Rep. Bill Cassidy defeated Democratic incumbent Sen. Mary Landrieu in Louisiana's December 6, 2014 United States Senate run-off race. Congressman Bill Cassidy is a lifelong public servant. He is a physician, a teacher, a community leader, father, and husband. As an associate professor of medicine with Louisiana State University, Bill has provided care for uninsured patients and taught doctors in training at Earl K. Long Hospital in Baton Rouge for the last twenty years. Bill co-founded the Greater Baton Rouge Community Clinic, a clinic providing free dental and health care to the working uninsured. Bill also created a private-public partnership to vaccinate 36,000 greater Baton Rouge area children against Hepatitis B at no cost to the schools or parents. In the wake of Hurricane Katrina, Bill led a group of health care volunteers to convert an abandoned K-Mart building into an emergency health care facility, providing basic health care to hurricane evacuees. Raised in Baton Rouge, Bill is the fourth son of Jim and Betty Cassidy. He attended Tara High School, LSU and LSU Medical School. His brothers are Jim, David and Steve. He is married to Laura Cassidy, who is a retired general surgeon specializing in breast cancer. Bill and Laura attend church at the Chapel on the Campus and they have three children. Before his election to serve Louisiana's Sixth District in the House of Representatives, Bill served in the Louisiana State Senate. In the U.S. House, Bill serves on the Energy & Commerce Committee and its subcommittees on Health; Energy and Power; and Environment and the Economy. He serves as an Assistant Whip for the House Republican Conference. His legislative focus is health care and energy. "Over 30 years I have witnessed the government get more involved in patient care and I have not witnessed improved quality or access to health care because of government intervention. That’s why I believe in free-market health care solutions that give patients the power, not Washington DC bureaucrats."